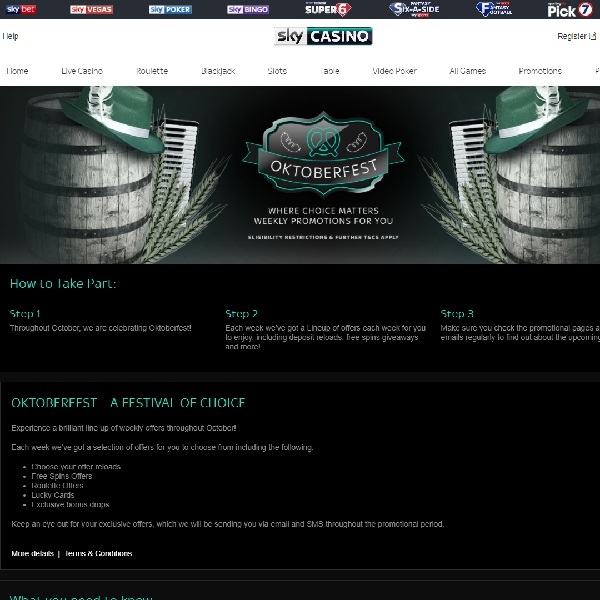 All month long Sky Casino is running its Oktoberfest promotion and each week you can take advantage of a number of special offers. The promotions on offer include free spins, roulette offers, lucky cards, bonuses and more. All you have to do is head over to the casino and see what is available each week. For instance, this weekend on Saturday and Sunday there will be special Oktoberfest cards hidden in the blackjack decks. If you are dealt one then you will be given a bonus the next day. Furthermore, there are 1810 free bets to be won on Roulette each week. Just opt in and bet £20 on Sky Bet Roulette to enter the prize draw. Be sure not to miss out on any of the great promotions this month, head over to Sky Casino today and start enjoying the Oktoberfest promotions right away.